Italian cyclist Vincenzo Nibali has been booted from the Vuelta a España after he was caught holding onto his Astana team car and getting towed back towards the front of the race. He was caught in a big crash towards the end of the stage, then got some motorized help to catch back up before the finishing climb. Nibali, the current Italian champion, won the Vuelta in 2010 and finished fourth in this year’s Tour de France. Astana’s directeur sportif Alexandre Shefer has also been kicked out. You can see him in the video linking up with his car then accelerating away from the rest of the chase group. 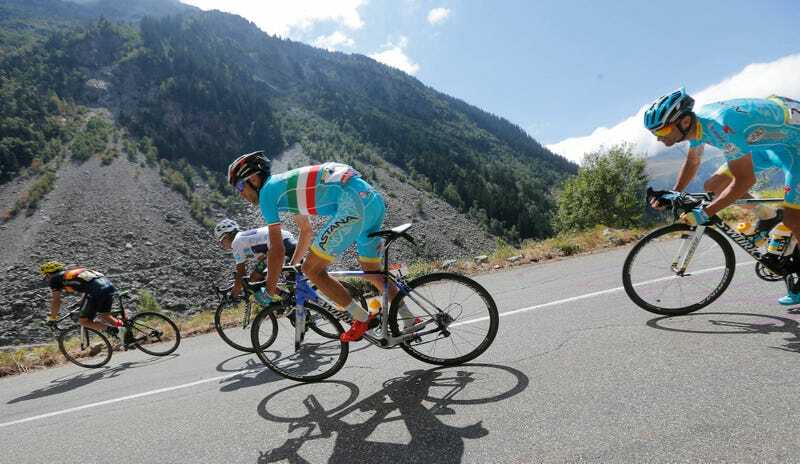 Nibali got a pretty egregious free ride and caught up to the peloton before getting dropped on the final climb. The UCI allows riders to hold onto their cars if a medic is giving them medical care, but Nibali had already been riding for 14 km after the crash when he incident took place. Riders are regularly fined for ‘sticky bottles,’ but Nibali’s assist was over the line. Astana appealed for a time penalty instead of an ejection, but the head commissaire is standing firm. Nibali has never been far from controversy this summer. He won Stage 19 of the Tour, but only after attacking the front group when Chris Froome stopped with a mechanical. Before a strong third week of the Tour, Astana manager Alexander Vinokourov may or may not have told Nibali to find a new team for 2016. Whether or not that’s true, their relationship has strained. Astana’s perilous status with the UCI and repeated doping positives don’t help either. Meanwhile, up at the front, young Esteban Chaves took the stage win and the first red jersey of the race. Favorites Nairo Quintana and Chris Froome finished four seconds apart and trail Chaves by 26 and 30 seconds respectively.